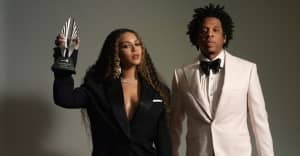 The producer broke down each of the album's tracks in an interview with TIDAL, and even explained how Jay wound up with co-producer credits on half of the project. "On the proper 10-song album, Jay is credited as co-producer on five of those songs because he basically made a playlist of songs that he listened to at his house and it was in the spirit of the soundtrack that he wanted to capture," he said. "So I just started sampling songs off of that playlist that he gave me." When it came to the song "Bam", the Sister Nancy-sampling standout that features reggae star Damien Marley, the song was almost a Beyoncé song - but her interest in the beat ultimately gave Hov the nudge he needed. "It was probably the most difficult song in my opinion. We could not nail it down for the longest time," he explained. "I credit Bey for helping us keep that because one day she came in — and she said a lot of things that day — but she was like, 'Man, just give me that beat. You messing around.' And I saw the smoke coming out Jay’s nostrils and the next morning he had the raps." Beyoncé, Hip-Hop, Jay Z, no i.d.